224th day of the year. There were then 141 days left in 2018.
on the 33rd week of 2018 (using US standard week number calculation). 53rd day of Summer. There were 41 days left till Fall. 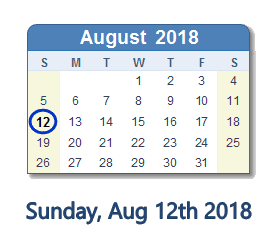 What happened on August 12th 2018? My 13 y.o. son told me that when he hits 99 pounds, he wants to eat one pound of nachos on his own so he can be 1% nacho. Today we honor the memory of Heather Heyer, whose spirit we see in every person who stands up to reject hatred and bigotry. Make no mistake: this fight goes on. The battle for the soul of this nation rests with each of us, everyday.